The Copper Monthly Metal Index (MMI) came in again at 79. Nearly all of the prices in the copper basket fell this month, with price declines in the range of 0.3%–1.9%. LME copper prices moved sideways during the month and oscillated around $6,424/mt, struggling to hold on to the $6,500 level (despite hitting that price at multiple points throughout the month). On the other hand, the price generally stayed above the longer-term resistance point of $6,380/mt. The price briefly dropped back later in the month before surging again, then sliding once again into early April. 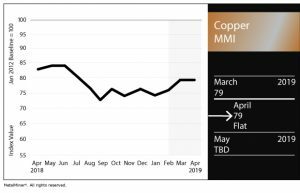 LME copper prices trended upward rapidly at the start of 2019 on concerns over supply. While the correlation between actual warehouse stocks and pricing generally falls outside of the factors driving actual LME copper prices, as pointed out in the most recent Monthly Metal Buying Outlook Report, recently traders traded on this information as warehouse stocks dwindled to historical lows. 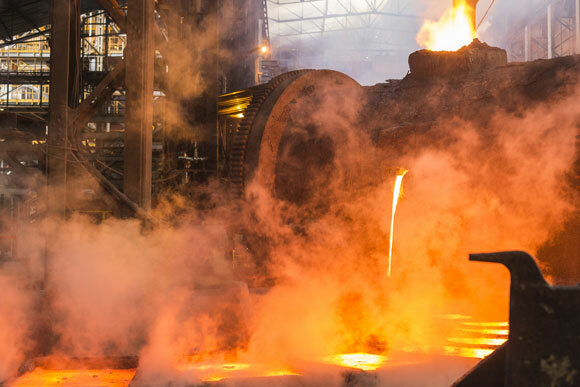 Another key factor driving the perception of a potential shortage of the metal could be that supply and demand factors do not presently balance, with a multiyear production deficit of refined copper, as reported by the International Copper Study Group (ICSG). While the bullish copper run ran out of steam by March when the price traded sideways, some of the increase in price from earlier in the year held, with prices now oscillating around a higher short-term level. However, the market remains in a sideways trend. In March, most of the prices in the basket dropped, with the exception of Korean copper strip, which increased by 3.6%. The Chinese prices in the basket showed the largest declines, albeit modest, in the range of 0.3%-1.9%. Japanese primary cash and Indian copper cash prices declined as well, by 0.8% and 0.9%, respectively. U.S. prices for copper producer grades 110, 102 and 122 were down by 0.5%. 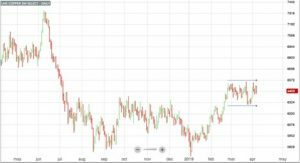 It’s important for buying organizations to understand how to react to copper price movements. The MetalMiner Monthly Outlook report helps buyers understand the copper marketplace.